Incredible footage from a Siberian tiger enclosure in China’s Heilongjiang Province has captured the moment a drone was taken down and torn apart by a group of the wild cats. 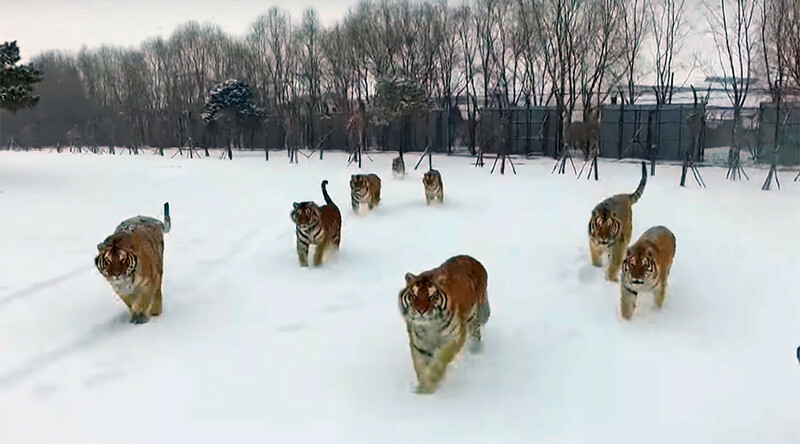 The drone belonging to reporters from China Central Television (CCTV) fell victim to the animals as it was being used to film aerial footage of the tigers playing in the snow. The drone seems completely in control of the situation as it glides through the air, leaving the lumbering tigers, many of whom appear to be carrying some extra weight, trailing in its wake. However, a slight mistake proves costly for the quadcopter as one of the tigers shows why they are among nature’s deadliest predators by leaping several feet and knocking the UAV to the ground. The curious big cats then gather around and inspect the gadget. They gnaw on it’s frame, perhaps annoyed it wasn’t edible, before chewing through the motor and releasing plumes of smoke.The bemused beasts then wisely back away, drone destruction complete. “We are not plump, we are really strong,” CCTV said in their news report as the tigers proved they are still effective predators despite not being in particularly lean condition.